Homepage. This page: Original 1930s literature from this defunct British car manufacturer. 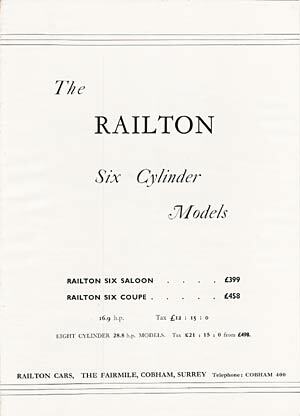 Shown on this page are scans from an original Railton sales brochure, covering the six cylinder saloons and coupes. 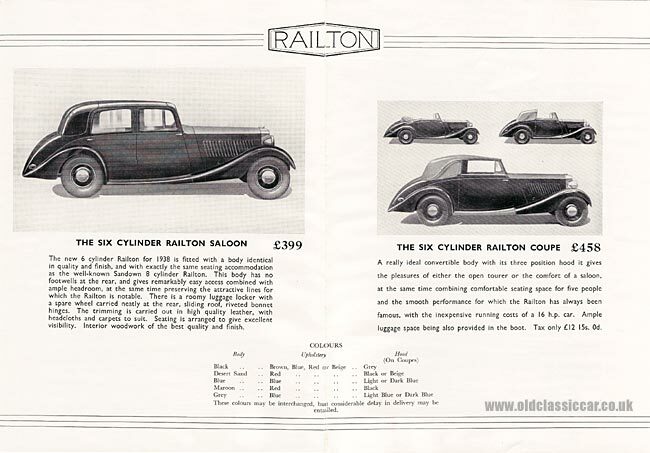 Here is the centrefold complete with black and white photographs showing the Six Saloon (£399) and Six Coupe (£458) ..
Railton produced quality cars during the 1930s at their factory in Cobham, Surrey. This leaflet promotes the 6 cylinder cars, but mention is also made of the larger 8 cylinder 28.8hp cars, which started at £498. Tax on the 16.9hp 'sixes' cost £12:15:0 at the time (ie £12.75 in modern money), with the larger cars having a tax rate of £21:15:0. The details given for each car follow. The new 6 cylinder Railton for 1938 is fitted with a body identical in quality and finish, and with exactly the same seating accomodation as the well-known Sandown 8 cylinder Railton. This body has no footwells at the rear, and gives remarkably easy access combined with ample headroom, at the same time preserving the attractive lines for which the Railton is notable. There is a roomy luggage locker with a spare wheel carried neatly at the rear, sliding roof, riveted bonnet hinges. The trimming is carried out in high quality leather, with headcloths and carpets to suit. Seating is arranged to give excellent visibility. Interior woodwork of the best quality and finish. A really ideal convertible body with its three position hood it gives the pleasures of either the open tourer or the comfort of a saloon, at the same time combining comfortable seating space for five people and the smooth performance for which the Railton has always been famous, with the inexpensive running costs of a 16hp car. Ample luggage space being also provided in the boot. Tax only £12 15s 0d. A note below the colour table advises that "These colours may be interchanged, but considerable delay in delivery may be entailed." 16.9hp three point "pneu mounted", 6 cylinder, 67.45mm bore, 127mm stroke, 2723cc capacity. Tax £12 15s 0d. Develops 76bhp at 3800rpm. Down draught carburetter fitted with automatic choke control. Specially designed aircraft radiator for maximum cooling efficiency. Temperature indicator on dash. 12 volt system. Battery and coil, fully automatic single breaker distributor, accessibly mounted for inspection. 72 ampere hour battery. "Duoflo" system with large capacity pump. Single aluminium alloy plate with spring cushion drive running in oil. Three-speed gear box mounted integrally with engine. Top gear ratio 4.55:1. Silent constant mesh second gear. Direct acting central change speed lever. Semi-floating Hotchkiss drive with heavy duty, helical bevel crown wheel and pinion. Of special design incorporating radius rods which relieve front springs from braking strain and provide great accuracy of steering at high speeds and over bad roads. Worm and sector type mounted on roller bearings. Long semi-elliptic springs front and rear, arranged to give maximum stability at speed and when cornering. Noiseless self-adjusting shackles. Suspension controlled by large capacity direct acting shock-absorbers on both front and rear axles. Lockheed-Bendix hydraulic system operated by foot, with mechanical safety pick-up on rear wheels. 72 ampere battery charged by 12 volt output controlled generator, solenoid operated starter electric screenwiper. Special high speed Lucas headlamps and streamline sidelamps. 13 gallon rear mounted tank. Petrol fed by mechanical pump driven from camshaft. Electrically operated petrol gauge on dash. Light steel type fitted with 6.00 x 16 tyres. Railton Cars, The Fairmile, Cobham, Surrey. Telephone: Cobham 400. Links for more Railton information.